Roger Christie, founder of the The Hawai`I Cannabis (THC) Ministry, was born in 1949 in Steamboat Springs, Colorado. His father was a member of the 10th Mountain Division that trained at Camp Hale and fought the Nazis in the Alps in World War II. In 1970, Roger enlisted in the US Army and was trained as an intelligence analyst, but became galvanized to action by the wrongful nature of war. He fought for and received an honorable discharge as a conscientious objector. 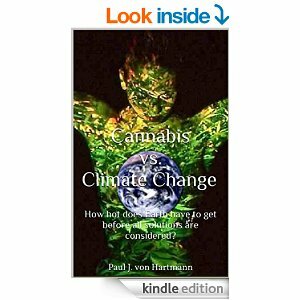 His success as a 21-year-old against the U.S. Army propelled him to pursue other goals, and he has been a steadfast advocate for the re-legalization of cannabis and hemp for more than 35 years. On June 19, 2000, Roger received a license to perform marriages in the State of Hawai`i, becoming the nation’s first licensed Cannabis Sacrament Minister (Hawai`i Department of Health License # 00-313). 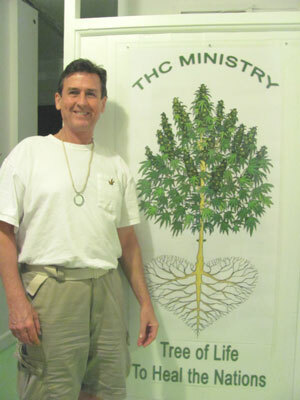 Roger founded The Hawai`i Cannabis (THC) Ministry in Hilo, Hawai`i to share the blessing of the Ministry with the world. Roger opens the Ministry to all sincere religious users and cultivators of Cannabis and has built a world-wide congregation of Cannabis sacrament practitioners from more than 60 countries. 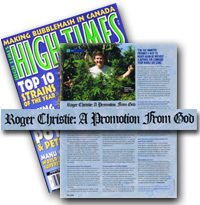 For more information on Roger Christie and the History of the THC Ministry, click here. Holy Cannabis sacrament is used by members for prayer, meditation, worship, nutrition, healing, and fellowship. We use Cannabis in formal rituals, including baptisms, weddings, & funerals. Cannabis use as a sacrament is also encouraged for communing with nature. Holy Anointing Oil, made according to the recipe given to Moses, is used to bless and heal. Making and providing Cannabis sacramentals for those in need is an important part of the THC Ministry’s mission. We teach members to bless their challenges, find the good in any situation and to honor all of God’s creation. We strive to live with modesty, good manners and humbleness. The THC Ministry is a universal religious organization that uses Cannabis to exalt consciousness, facilitate harmony, and become closer to God and Nature. Cultivation and enjoyment of Cannabis sacrament is a fundamental human right provided by God and protected by the U.S. Constitution. Sacramental use of Cannabis opens the mind, frees the soul and releases the body to commune with God and balance itself. Cannabis has been used for millennia as a sacrament by spiritual seekers & is the original sacrament of Hebrew, Muslim, Christian, Hindu, Shinto, Buddhist, Rasta and more. Cannabis is the Tree of Life, given to humans by God for food, shelter, clothing, fuel, medicine, sacrament and much more. Cannabis was given by God to help humans find answers to fundamental questions about the meaning of life and their place in it. Cannabis fosters a spirit of harmony and compassion among people. Holy Anointing Oil is a key component of the THC Ministry. The ancient recipe, given by God to Moses in Exodus 30:23, was made with myrrh, cinnamon, Cannabis (“fragrant cane”), and cassia infused in olive oil and blessed with prayer. The THC Ministry makes the Holy Anointing Oil of Moses and the christening oil of Jesus based on the Old Testament recipe. We’re honored to bring this age-old practice back to modern times.Our Holy Anointing Oil has had extraordinary effects on many physical ailments, including gangrene, arthritis & migraines. It is also used for spiritual purposes. The word “Christ” means “Anointed One.” Jesus Christ used Holy Anointing Oil to heal the sick and bless people. Show me the blessings in this situation…and hurry! We are safe, we are loved and all is well. Observe by giving thanks in formal or informal rituals using Cannabis sacrament. Cannabis sacramental use is a lifelong right given to the human race by the Creator of all things. The First Amendment to the U.S. Constitution protects religious belief and practice, and so does the written guarantee of every state Constitution. The United Nations Universal Declaration of Human Rights, adopted in 1948, explicitly protects religious freedom in Article 18.The Religious Freedom Restoration Act (1993); Guam v. Guerrero (2000); U.S. v. Bauer (1996); State v. Blake, 5 Haw. App. 411 (1985); Leary v. U.S. (1969); and U.S. v. Meyers (1996) all assist in defining the legal status of religious Cannabis.See our website for more legal information. Click here for more case law. Rev. Roger Christie is licensed by the State of Hawai`i to perform marriage ceremonies as a Cannabis Sacrament Minister (Department of Health License Number 00-313). The THC Ministry also serves as the Oklevueha Native American Church of Hilo. 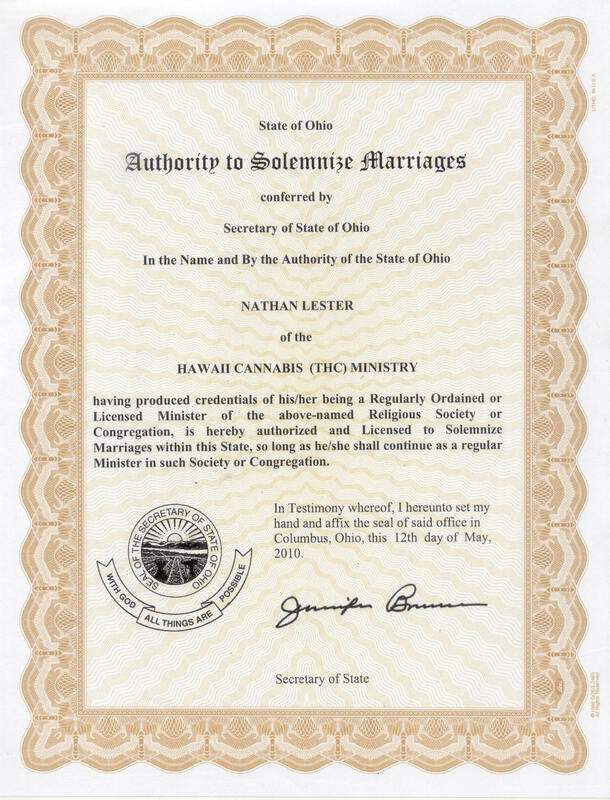 Cannabis Ceremonies: We provide Cannabis ceremonies, including weddings, funerals, baptisms, communions. Our Ministers will work with you to develop the right program for your needs. Counseling & Guidance: We provide guidance and counseling to our members when they need it. Medical Cannabis Education: We provide physician referrals and nutrition education to help patients who use Cannabis get the most effective treatment. Cannabis Advocacy: A big part of our mission is to help free people from the problems associated with Cannabis prohibition and discrimination. Our tools are designed to help build mana (inner spiritual strength) and provide education on THC Ministry beliefs, practices and more. Includes sanctuary signs, laminated ID cards, sacramental plant tags & the THC Ministry Guide to Cannabis Spirituality, with 180 pages of research on Cannabis religious use, articles and case law. Identify your plants as being for Cannabis sacramental use. Add to your legitimacy and build your mana by getting a THC Ministry Member ID card. Members must be over 21 and must affirm that they will use Cannabis sincerely as part of their religious practice and method of worship. Good manners and respect are proof of sincerity. Members use sacramental Cannabis responsibly for personal, private spiritual practice. You provide the sincerity, and we provide the education and the tools to demonstrate your legitimacy. As a THC Ministry member you will have a religious defense to prosecution for spiritual Cannabis for the rest of your life. In addition to our tools, we provide spiritual guidance, ceremonies, blessings and more. Membership is free. Enroll online today. Cannabis Sacrament Ministers are in high demand all over the world. Email Roger Christie rogerchristie@gmail.com to discuss whether a THC Ministry branch is right for you. Helping you heal yourself is a big part of the Ministry’s mission. The THC Ministry offers physician referrals for people to become part of the state’s medical Cannabis program. New patients and those who are curious about Cannabis for medical use can also consult with our Ministers on how Cannabis can be incorporated into the patient’s spiritual life & self-healing program.